I hope that your baby is just a slow grower and the hormones are coming! Maybe you're not as sensitive to the hormones this time around. I haven't been sick at all. This is my first pregnancy so that's making me a little bit nervous like maybe something is wrong because i'm not sick. But i have heard lots of people say they never had sickness. I have one niece who had no sickness with her first pregnancy (baby was fine) and now she's pregnant again and has been full on sick since she first POAS. I know everyone is different and every pregnancy different. I'm hoping and praying for good outcomes for us both!!!! Thank you for the encouragement! Science isn’t always by the book so there’s always room for mysterious happenings! I do wonder if somehow my surrogacy maybe changed my pregnancies ... I wasn’t sick with her baby hardly at all. And now I’m feeling basically great minus the exhaustion and occasional food aversion. Only a few more days and we will know our fate! I hate waiting !!!! Oh the waiting is the WORST! I thought the TWW was bad.... DH and i are going out of town tomorrow for the weekend so i'm hoping that will help me take my mind off of things. Well I am still in shock - ultrasound yesterday showed a perfect 7 week 1 day baby with a heartbeat of 136. 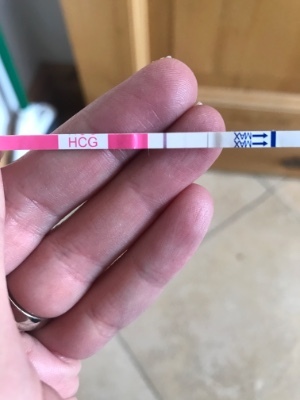 Apparently I really am pregnant with a complete fluke of a miracle! How my husbands sperm survived 7 days, while I also ovulated a week early- is beyond me. And how this baby is sticking around without aspirin and progesterone is also a mystery . I’ve had 15 miscarriages so the odds were definitely not in my favor. I am completely shocked. We had cleared our schedules this week for a d&c assuming baby had stopped growing 2 weeks ago. Even my doctor is shocked given my history that this happened ! Now I’m just trying to mentally accept another pregnancy ????. My surro baby is only 10 months old - and I have a two year old! This will be my third baby in less than 3 years. Goodness! I hope my body has one last go left. I’m 36 years old and pretty worn out lol. This sounds like the ectopic I had two years ago???? Yes I wondered the same thing! Weirdly I have a healthy baby trucking along in my uterus right where it should be. I am baffled! The dates do not match up but I suppose it is not a perfect science ! Happy to hear a positive outcome and praying for grace in the transition—mentally and physically.